The allure of Maui’s gorgeous nature is calling you, but how do you decide between tent and van camping? We’ve put some thought into it for you. Today is a rainy day here on Maui. Sometimes the tropical storms pass through in a few hours. Once and a while the rain continues off and on for days. Camping in Maui is unforgettably beautiful, but when the weather rolls in, sturdy walls, a roof, comfortable seating, and a stove are priceless. If the weather is preventing you from experiencing what you’d like to, in a campervan rental, you can drive your home on wheels to a sunnier side of the island without having to pack up your site, take down your tent, and transport your soaking supplies elsewhere. In a Maui camper, you travel with your own kitchen and your supplies stay safe from rodents and hungry birds and insects. It’s jungle living, after all! 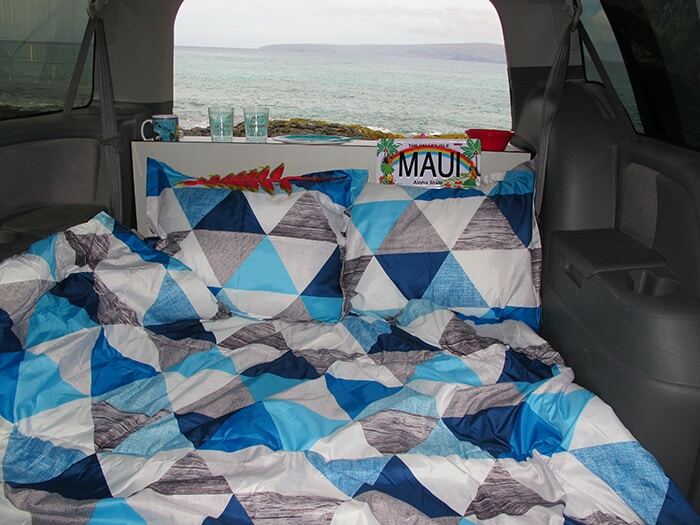 And finally, van life is in itself a Maui experience. Maybe you don’t want to do the full-time van life thing (yet!) like so many Maui locals, but you’ll get a taste of the type of freedom and fun that van lifers guard as a closely kept secret!